DVMP Pro is the most comprehensive and reliable method of time-stamping your camcorder video files. It extracts the recording date and time (also known as datacode or datecode) and stamps it onto the visible area of each frame. See the original date and time of recording change in real-time and with frame accuracy. Choose the exact format of the date and time stamp, also the font, size, position and language. Import time-stamped files into your own video editing or DVD authoring software. Works with video files from many cameras, camcorders and smartphones - try the DEMO version with your own files. See table below for supported file types. Play camera files and view the date and time changing in real-time - handy if you don't need a stamped file and just need to see the date and time immediately! Also stamp or view other metadata information such as camera exposure settings or GPS location when the recording was made, changing in real-time. Exact info available will vary depending on camera/camcorder model - try the DEMO version with your own files. See a GPS map of where the video was recorded (for cameras with inbuilt GPS units). DVMP Pro is useful in the investigation, security, military and forensics sectors where you need to know reliably when and where video files were recorded, and when a particular recorded event happened. The GPS features are also useful in geographic, marine and traffic surveying when you need to know where video was recorded to the nearest video frame. See the list of features below - and for more detailed info click the links on the left. Also there's masses of online help. Transparent background option - for importing to video editors as a separate track. 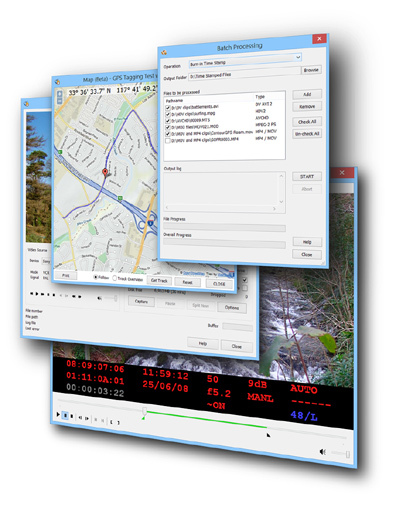 Useful for video forensics and investigation, and training. Interactive moving map that follows the camera position (beta add-on). DVMP Pro time-stamps, plays and displays the metadata for AVCHD, MOV, MP4, HDV, DV, MOD and Sony HDD camcorder video files. See "Supported File Types" for more details of these file types. Files can also be time-stamped using the Burn-in Time Stamp tool. All files must be "camera-original" (i.e. files copied directly from the camera without any further processing). The vast majority of video processing software does not understand the camera metadata or completely ignores it. If the file has been though any form of processing, filtering or transcoding software, then the metadata will have been thrown away and will contain NO date, time or any other metadata. This is why only camera-original files are supported by DVMP Pro. DVMP Pro's processing tools are available from the Tools menu, or in the Batch Processor where lots of files can be processed as a batch. The Tools and their supported file types are summarised in the following tables. Playing and processing some file types requires a lot more more processing power than others. Therefore there are 3 broad levels of system requirement for playing files. A slightly lower spec can be used for time-stamping and other tools which will just take longer to complete. Core 2 Duo, 2GHz, or better. Intel Pentium 4 / AMD Athlon 1.2GHz, or better. MOV and MP4 files may contain video in many different formats and resolutions, so requirements may vary between the two higher levels. DVMP Pro is only available for Microsoft Windows. It does not work on Mac operating systems. Windows 10, 8.1, 8 and 7 are supported. Earlier versions of Windows such as Vista and XP are not supported in version 7 of DVMP Pro. Try the DEMO version to check its performance with your own video files before buying. Download our 14 day demo version - this has almost all of the functionality of the full version, but all output files are watermarked. ©2003-2019 Code Station Ltd. All rights reserved.